ABC: The season finale of THE GONG SHOW was steady at 0.4. A special episode of TAKE TWO was abysmal at 0.2, and the regular 10PM airing held the 0.4 of the last episode 2 weeks ago. CABLE HIGHLIGHTS: MTV’s JERSEY SHORE led Thursday cable, down 0.03 to 0.80, followed by the official premiere of PRETTY LITTLE MAMAS at 0.25. ESPN’s inaugural COLLEGE FOOTBALL telecast of the new season was at 0.70. 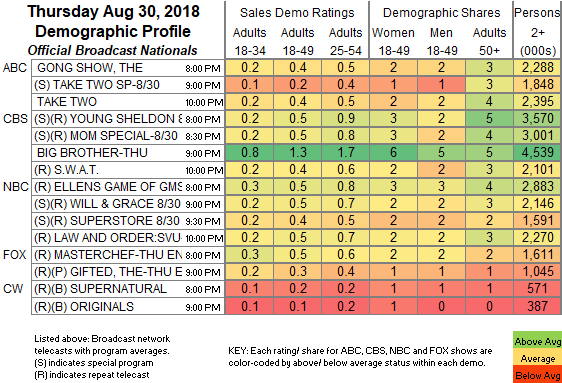 On Tru, IMPRACTICAL JOKERS was steady at 0.37. On USA, QUEEN OF THE SOUTH was also steady at 0.37, and SHOOTER ticked up to 0.18. On HGTV, FLIP OR FLOP ticked down to 0.36, HOUSE HUNTERS INTL shed 0.02 to 0.26, and HOUSE HUNTERS was at 0.25. FX’s SNOWFALL ticked down to 0.35. On Food Network, GREAT FOOD TRUCK RACE gained 0.04 to 0.34, and the premiere of BITE CLUB was at 0.29, with a late-night BEAT BOBBY FLAY at 0.24. MSNBC’s RACHEL MADDOW SHOW led cable news at 0.31/0.47/2.8M, with Fox News’s HANNITY at 0.28/0.45/3.1M, and CNN’s CUOMO PRIME TIME at 0.24/0.35/1.3M. On ID, SOMEONE YOU THOUGHT YOU KNEW edged up 0.02 to 0.30, and THE PERFECT MURDER lost a tick to 0.22. On A&E, NIGHTWATCH NATION gained 0.02 to 0.29, and THE FIRST 48 was at 0.28/0.26, compared to last week’s 0.26/0.23. On History, MOUNTAIN MEN rose 0.03 to 0.29. NFL Network’s live NFL PRESEASON games were at 0.23/0.19. We’s BRAXTON FAMILY VALUES ticked up to 0.19, and BOSSIP stayed at 0.09. 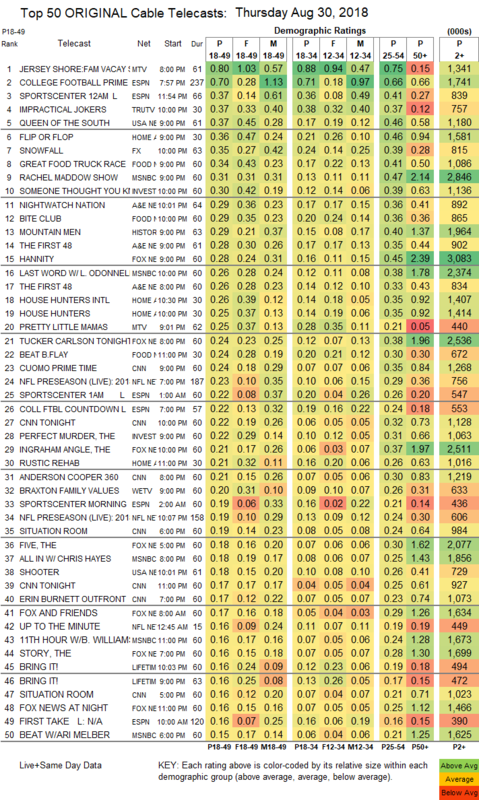 Lifetime’s BRING IT was at 0.16/0.16, compared to last week’s 0.15/0.15. BET’s THE GRAND HUSTLE ticked down to 0.11. CMT’s DALLAS COWBOY CHEERLEADERS climbed 0.03 to 0.10. POP’s IMPACT WRESTLING grew by 0.02 to 0.07.